Before you inspect it closely, Hygrophorus russula certainly does look like a russula. 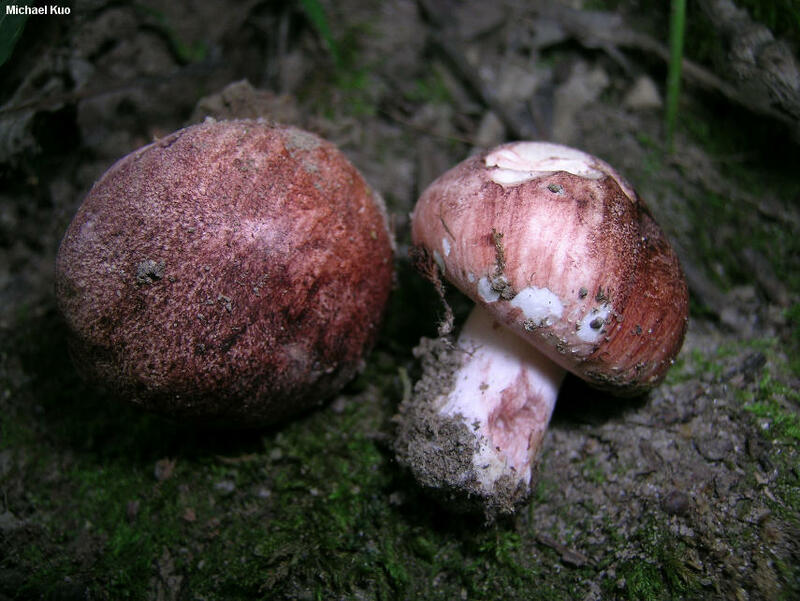 In fact, when I first found this species, nearly 20 years ago, I began my journal entry with the words "very curious pink russulas." But by the time I was describing the flesh as "firm and white throughout," my mushroom beginner's instincts were twitching: "I'm beginning to doubt these are russulas." 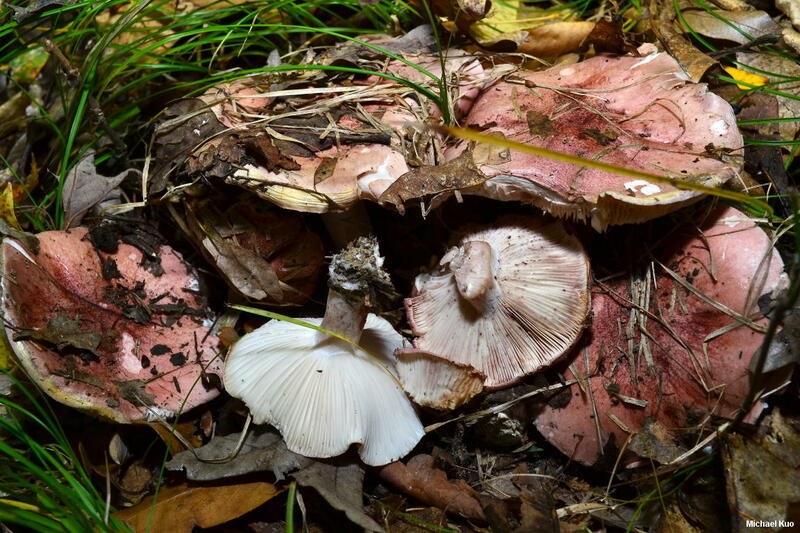 The flesh of Hygrophorus russula is not at all crumbly and brittle like the flesh in russulas. 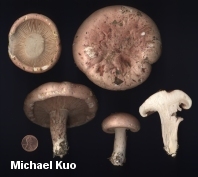 Truth be told, however, the species looks a lot more like a russula than a waxy cap, which is what it is. 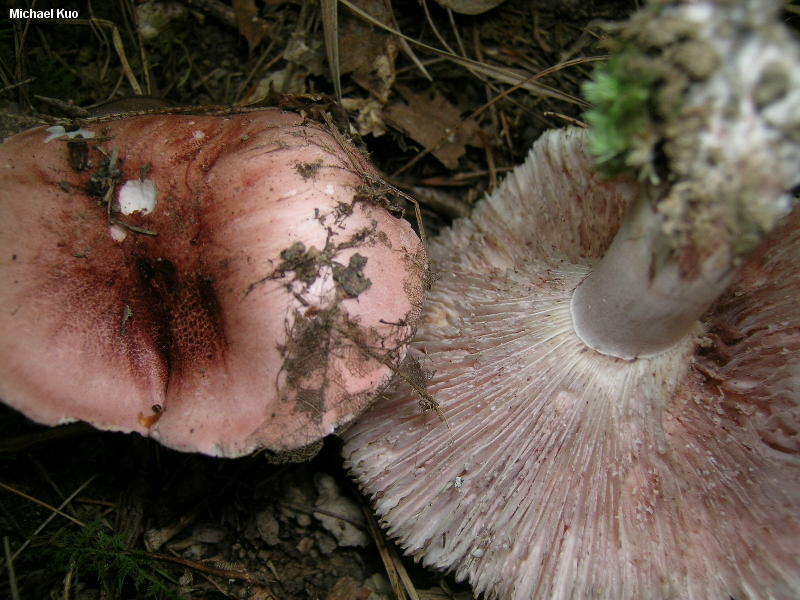 Two of the most well known defining features of waxy caps are sticky caps and thick, waxy gills; Hygrophorus russula does have a sticky cap, but it soon dries out--and the gills are only arguably "thick and waxy." Features defining Hygrophorus russula include its russula-like stature, the reddish spotting on the mature gills, the habitat under hardwoods, and the fact that the cap and stem often feature streaks and spots of purplish pink shades. 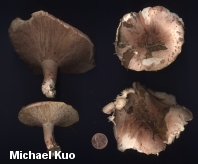 Several conifer-loving Hygrophorus species are very close in appearance, including Hygrophorus erubescens, with distant or nearly distant gills, and more pronounced yellow bruising; Hygrophorus amarus, with a bitter taste and pale greenish yellow immature gills; and Hygrophorus purpurascens, which has a partial veil when young. Ecology: Mycorrhizal with oaks and other hardwoods; growing scattered or gregariously, sometimes in fairy rings or arcs; late summer and fall (also over winter in warmer climates); apparently widely distributed in North America. The illustrated and described collections are from Illinois and Kentucky. Cap: 4-13 cm; convex when young, becoming broadly convex, flat, or shallowly depressed; slimy when fresh, but often drying out quickly; bald, or finely hairy in places; the margin at first inrolled and soft or cottony, but eventually unrolling; reddish to pinkish, often with streaks or spots of color; often bruising yellow in places, especially near the margin. Gills: Broadly attached to the stem or beginning to run down it; close; white when young, but soon developing reddish spots or becoming pinkish overall. Stem: 3-7 cm long; 1-2 cm thick; more or less equal; white at first but soon developing the colors of the cap; bald or finely hairy; solid. Flesh: White, or flushed with pink; thick; firm. Chemical Reactions: KOH on cap surface grayish tan, erasing pink. 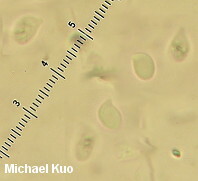 Microscopic Features: Spores 5-8.5 x 3-5 µ; smooth; ellipsoid; smooth; hyaline in KOH; inamyloid. Hymenial cystidia absent. Basidia 4-sterigmate; to about 50 µ long. Lamellar trama divergent. Pileipellis an ixotrichoderm. REFERENCES: (Schaeffer, 1774) Kauffman, 1918. (Fries, 1821; Saccardo, 1887; Hesler & Smith, 1963; Bird & Grund, 1979; Smith, Smith & Weber, 1979; Largent, 1985; Arora, 1986; Phillips, 1991/2005; Lincoff, 1992; Barron, 1999; McNeil, 2006; Miller & Miller, 2006; Kuo, 2007; Binion et al., 2008; Lodge et al., 2013; Kuo & Methven, 2014.) Herb. Kuo 09289602, 09300303.